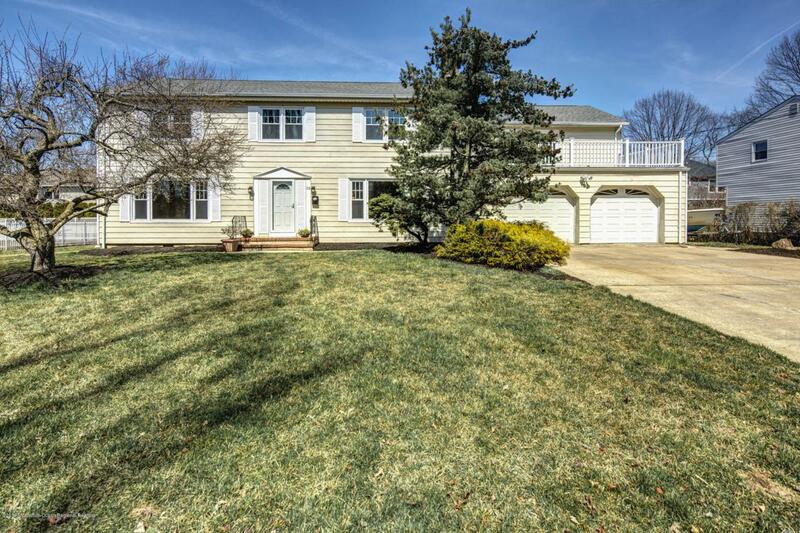 Center Hall Colonial Home, with 4 Bedrooms, 2.5 baths, large family wood burning fire place and Oak cabinets. Home has been freshly painted and updated. Renovated eat-in kitchen with new Kitchen Aid appliances (refrigerator, gas convection oven, convection microwave, and dishwasher) new cabinets and counter tops. Bathrooms have been remodeled and updated. Laundry room has Whirlpool washer and dryer. 3 Zone base board hot water heating with central air conditioning and full house fan. 35 x 18 foot Bonus room over garage. Over sized 2 car garage. Home contains 2 decks: one in the fronton the second floor and a rear deck off the kitchen. Short distance to Blackberry Bay Park. Close by local NYC Transit: rail,bus and high speed ferry service to NYC. Listing information © 2019 Monmouth-Ocean MLS. Listing provided courtesy of Dennis Soboti of Resources Real Estate.